Most businesses don't take the time and trouble to mail clients on their birthday. 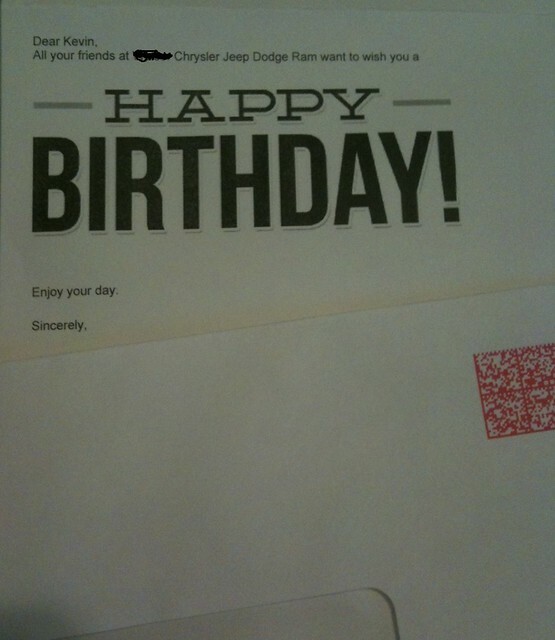 In fact ... the letter above (from a Twin Cities car dealer) was the ONLY birthday greeting I got from any company I do business with. So it's even more of a shame that they botched their opportunity to be unique, generate goodwill ... and sell me something. Really, they wouldn't have had to try too hard to get my money. I got lots of phone calls and Facebook greetings on my birthday ... but only 1 card in the mail. That means any colored envelope in my mailbox would have stood out like a sore nose. 1) They mailed their birthday wishes in the most business-like envelope imaginable -- white #10, with an address window and metered postage. This envelope screams, "Bill!" or "Impersonal message!" ... anything but "Happy Birthday." 2) They didn't offer a discount or otherwise try to sell me anything. Now don't get me wrong. I mail all kinds of letters to my clients that don't try to sell anything. They're generally thank-you notes or other cards. But if you're going to pass up the opportunity to hand-write a personal greeting or at least sign the card, you might as well try to sell something. But they didn't even do that. So this card fails twice. Bad, bad business. Tip: No matter what holiday you write to your customers or clients about, you might as well do it right. 1) Show up in a festive-looking envelope that telegraphs a message of fun or personal contact. 2) If you want to offer greetings only, fine. Say, "Happy Birthday! Enjoy your day." But at least sign the darn thing, include your picture, or do something else to prove there's a human behind your message. 3) If you want to sell something, make a relevant offer with a deadline. Examples: a Happy Birthday Discount equal to your age (up to 99% off) ... a Spooky Halloween Discount of 31% off that ends Oct. 31 ... you get the idea. Resource: Want to put an end to "feast-or-famine" syndrome in your business? My Client Cloning Kit can do that for you. Grab your copy here. Yeah, I know. It looks like a Declaration of War, not an ad ... but that's part of what caught my eye. Score one for the guy/gal who wrote it. 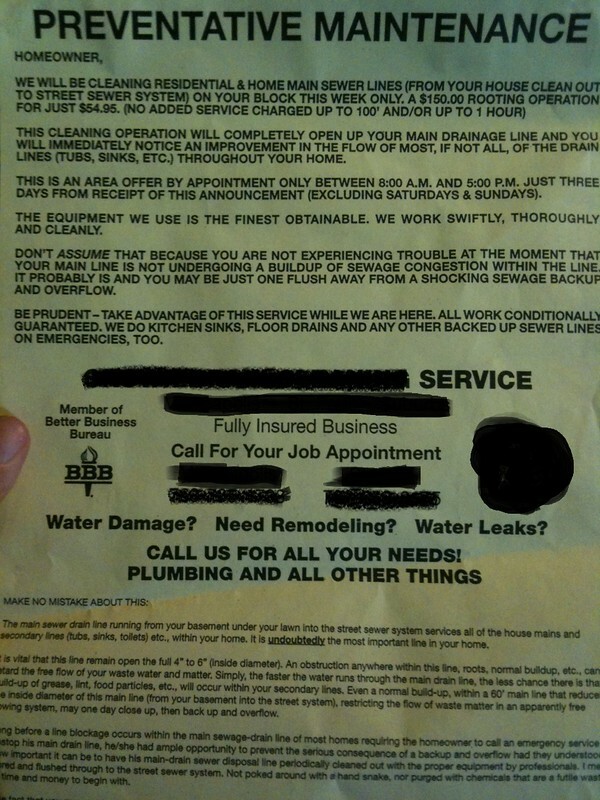 Despite the obvious ploy at the beginning ("We will be cleaning ... on your block this week only") the copy is of interest to me, because my sewer lines have been cleaned approximately never. And there's a lot of solid, educational detail here. I read almost every word. Which is proof that people DO read long copy -- as long as they're in the market for what you sell. Score two at this point. Now I'm ready to research this company online and see if I can find any rave reviews or complaints. ... because I found a truly nasty, detailed "F" rating for them on a major consumer opinion website (I won't say which). And that stopped me dead in my tracks. As a result, I'll call somebody else. Think for a moment what just happened here. 3) Some other company is going to get my hard-earned dollars. 1) Your marketing doesn't exist in a vacuum. Everything you do either attracts or repels customers. And it doesn't take a whole lot to tip the scales the wrong way fast, as happened here with me. 2) Your customers have an audience. If you tick people off, they will tell others. So, do everything in your power to find and head off complaints before they get posted online. Or, if a customer does trash you online, SOLVE THEIR PROBLEM. Then beg/plead with them to post an update. 6 Figures in Only 30 Hours a Week? If you've read any of my posts on 80/20 Marketing, you know that a minority of actions usually leads to a majority of your revenues. In other words, when you ask the right questions and know the vital few activities that really matter, you can do more of what makes you money in the time you now waste doing what doesn't. I tracked down 3 examples of smart, 80/20 uses of time from an article in OPEN Forum, featuring "entrepreneurs who work 30 hours or less per week and still make well above six figures per year." 1. Time block. Travis Miller and Jimmy Vee work around 30 hours per week and take about eight weeks of vacation per year. They are co-founders of Gravitational Marketing in Orlando, Fla., and attribute their enviable work/life balance to planning ahead. Each month, they take out a calendar and color code days based on tasks; green days are dedicated to sales presentations, orange days are for client meetings, red days are for administrative duties and so on. “It helps us be diligent with our time; otherwise we would get eaten alive by things that come up and have to work 12-hour days,” Vee says. 2. Outsource. Melanie Benson Strick hates email. When she found herself spending up to three hours per day going through messages, she looked into outsourcing inbox management. Today, Benson Strick, founder and CEO of Success Connections, a business training and coaching company in Chatsworth, Calif., spends just 30 minutes answering emails carefully selected by her virtual assistant, messages that only she can answer. 3. Love your regulars and pay for referrals. It’s much more expensive to win a new client than to please a current one, so focus on making your loyal customers happy, says Benson Strick. Along the same line, consider instituting a referral program. Debra M. Cohen, founder of Homeowners Referral, is a big proponent of such arrangements and happily hands over a percentage of revenue to whoever referred her the business. Now. If you want to go deeeeep into the 80/20 Rule ... and use it to revolutionize your business, you might take home an extra $2.1 million. I did. And I explain how here. You're looking at a picture of the cleverest thank-you card I've ever received. 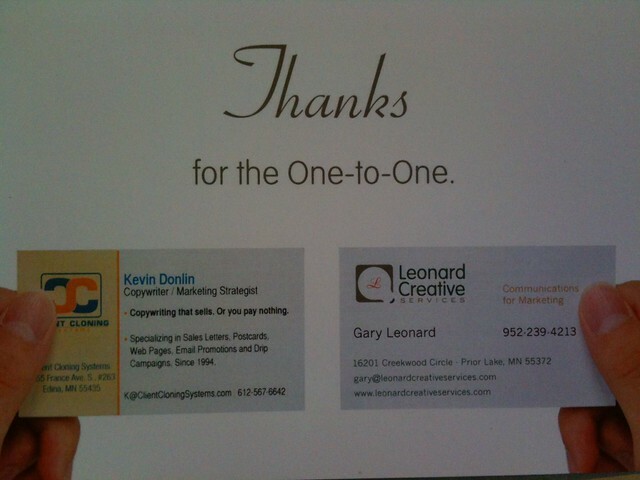 This was mailed to me by Gary Leonard, a designer and advertising copywriter, from Leonard Creative. He sent it after he and I sat down for coffee to discuss how to send each other leads and cooperate on projects. Gary used Send Out Cards to create and mail this thank-you card. On the cover is a photo he took of both our business cards; inside is a nice message from him. Now. Anybody can say they're creative. But words without actions mean nothing. Gary, however, proved he's creative by building and mailing me this card. That's something. Beyond creativity, Gary proved he has the people skills to take care of any prospects or vendors I refer to him. That's important. And beyond that, Gary is leveraging 80/20 Marketing principles by following up with the leads and potential joint-venture partners he already has. Think about it: How often do you talk to or meet a prospect ... then fail to do anything strategic after the fact? More often than you'd care to admit, probably. Smart people, like Gary, know that the fortune is in the follow up. By putting your prospects through a structured system of follow-up marketing and nurturing -- which should include thank-you notes -- you can turn more leads into sales, automagically. "I sent the thank you card to an attorney. She thought it was cool enough to give to the firm's marketing manager, who now wants an appointment with me. Not only is it a small sample of my creative work. It also has all of my contact information right on the front of it." It's June. Shouldn't I be writing about summer vacation? No. Because school is never out for the professional. 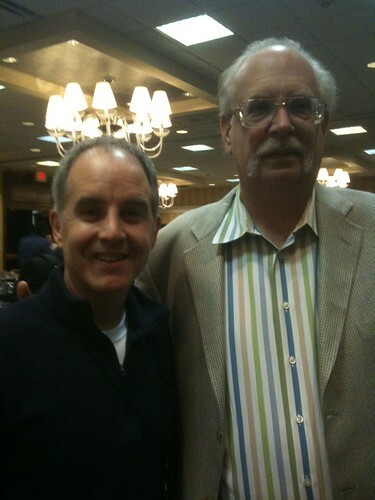 Case in point: That's a picture of me with Dan Kennedy, one of the world’s premier marketers. Last month, I invested $4,000 and 4 days "going back to school" with Dan at a small gathering of marketers in Cleveland, where that picture was taken. A copywriter like me training with Dan is like a chef training at Le Cordon Bleu. The latest and best tips for using direct mail: list rental, list segmentation, psychographics, demographics, and other fun stuff. To serve my clients and readers, better -- by getting smarter. Think about it: Would you trust a doctor who didn't keep up with the latest medical research? Or a pilot who stopped taking flight simulator training? Of course not. So, why does lifelong learning seem surprising in any other field? I have no idea. But it's a golden opportunity for you, if you seize it. Especially if you continue to get better at those things you already do well. For me, that's marketing -- finding, getting, and keeping clients. I can't learn enough. I study before breakfast, on Friday nights, even weekends. I listen to marketing CDs in the car ... even in the shower (it's complicated). Bottom line: It's your strengths that make you successful. In Strengths Finder, Tim Rath writes: "People have several times more potential for growth when they invest energy in developing their strengths instead of correcting their deficiencies." This is counterintuitive. Most people work on their weak areas, hoping to learn something new or improve a basic skill. And, in life, most people are … unsuccessful. By contrast, successful people are often unbalanced. While I haven't yet reached the pinnacle of success, I sure am unbalanced. Bookkeeping? Taxes? Graphic design? Web site geekery? Mailing this newsletter? I outsource all that stuff. Long ago, I learned that the world's two greatest investments are self-development and marketing. Marketing offers you unlimited opportunities to create wealth. You could spend weeks of research ... plunk down $3,000 to buy a stock ... then cross your fingers, hope and pray for a return of 15% -- 15 cents for every dollar. That's how ordinary people "invest." Or you could invest $3,000 in a sales letter mailed to your best prospects and clients ... and reasonably expect a return of 50%, 75%, 100%, or more -- getting back $1 or more for every dollar you invest. Marketing is how smart people invest. And I'm happy to help you with your marketing. But when it comes to self-development, you get the best return on your investment by focusing on your strengths -- getting better at what you already do well. What's the first thing you did this morning? I bet it was reading messages on your cellphone. The question is why? Recent studies suggest almost 80 percent of cellphone users sleep with their phones in their bedrooms. Among entrepreneurs, I bet that number is even higher. So why is reaching for the phone first thing such a problem? Because how you start the day sets the tone for the rest of your day. If your first act is to check for texts or emails, then someone else sets your priorities before you’ve had breakfast. And those emails seek your time, attention, help and brain space. You start your day being reactive to other people rather than proactive about your goals. You have surrendered control—which is crucial to your well-being, success and happiness—to others. When you check your smartphone first thing in the morning, you're saying, in effect: "Hey, world, please tell me what to think." In other words, you're making yourself a slave to outside forces. I've written before that email is your public to-do list that anybody can get on. The longer I go each day without checking email, the more I get done. Every. Single. Time. Just think: To become more productive, starting tomorrow, you don't need to spend one penny or one minute on a technology upgrade. It's a technology downgrade you need. Try it and post your results in the comments section below.